Live from the ARC World Industry Forum! I’m in Orlando, FL today at the sixteenth annual ARC World Industry Forum hosted by ARC Advisory Group, the leading research and advisory firm for industry and infrastructure. ARC Advisory Group covers technology related to business systems, product and asset lifecycle management, operations management, energy optimization, automation systems and supply chain management. In fact, I just delivered a presentation on one of the key themes of this year’s forum, Supply Chain Integrity. 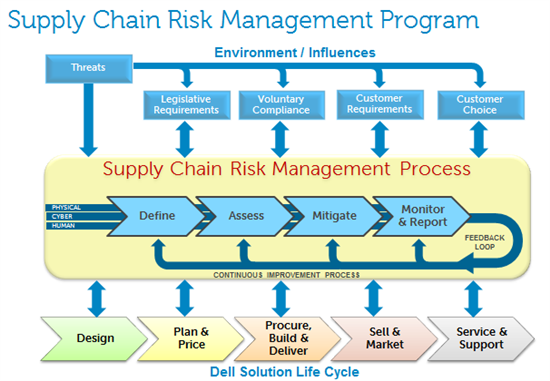 I had the pleasure of serving as a keynote speaker alongside representatives from Johnson & Johnson and Bayer CropScience to speak to Dell’s approach to supply chain risk management. In our core business of hardware technology, we need to be able to protect our products and customers from counterfeit electronic components and highly sophisticated malware throughout the production process. What we’ve learned is that maintaining supply chain integrity doesn’t start with our suppliers…it is an end-to-end process that begins with the design phase of a new system. As we work with our partners on new products, we’re able to comply with existing legislation such as the Federal Information Security Management Act (FISMA) and the Trade Agreement Act (TAA). We’re also able to anticipate future changes driven by potential new legislation such as the Lieberman/Collins bill. As the product moves through planning, procurement and sales, we continuously manage the various supply risks, whether they are cyber, physical, or people related. The risks are defined and assessed, and then mitigated and monitored, with full reporting throughout. We launch quite a few products each year at Dell, so we have ample opportunity to learn and drive continuous improvements into the process. Comment here to give us your feedback or tell us about your company’s approach to supply chain integrity.